Deep Blue Professional 2-Way Betta Aquarium housing a male (left) and female pair of Red Dragon Halfmoon Bettas. There are no shortages of “betta tanks” on the market. These are typically small plastic containers, often colorfully-themed aquariums holding significantly less than a gallon of water. While these aquariums certainly fill a large demand for inexpensive, stylish homes for our favorite desktop fish, they aren’t exactly made for the long haul. Plastic likes to dull, scratch, get hazy and brittle. I don’t remember how, but I stumbled across the Deep Blue Professional series of betta aquariums. They currently manufacture 3 variations based on the number of maximum potential compartments; 2-way, 3-way, and 5-way models are offered. The 2-way is a little over 1 gallon and 8″ x 4.75″ x 8.25″ H; 3-way is just over 1.5 gallons and 12″ x 6″ x 6″; 5-way is around 2.7 gallons and 18″ x 5″ x 7″. 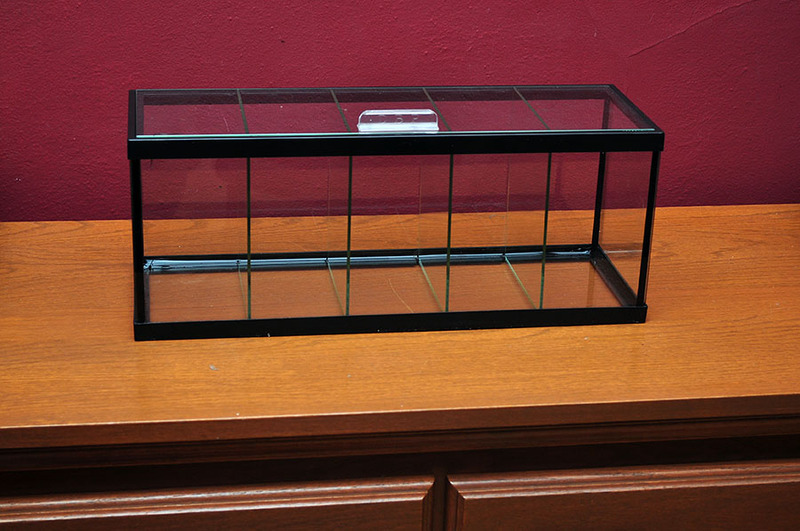 All of these aquariums feature removable glass dividers, allowing you to reconfigure the compartments as you see fit. I purchased several of these tanks to investigate them firsthand. Bubblewrap galore! 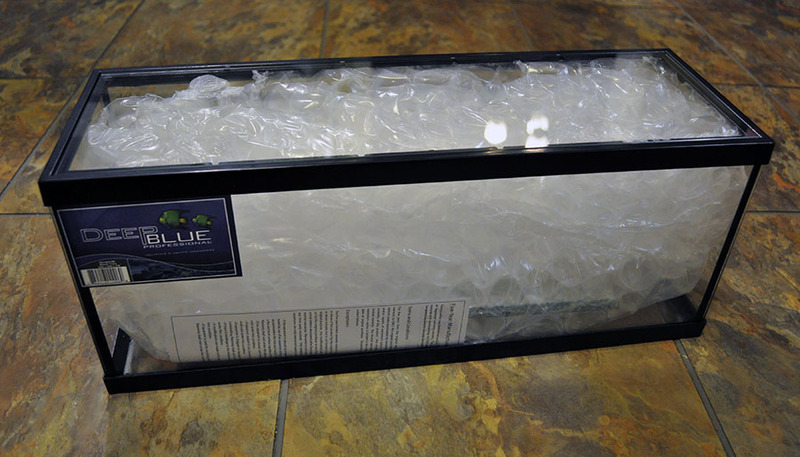 A glass betta tank bundled for shipping. I ordered my aquariums from an online vendor, so I can’t say for sure who’s responsible for all the protective packing with the tank. While there wasn’t quite enough bubble wrap around the tank to win a science class egg drop competition, all five aquariums I received were intact; no broken glass! Removing the outer bubble wrap, we get down to the display packaging of the tank; no doubt these would look nice on the shelf at a local fish shop. 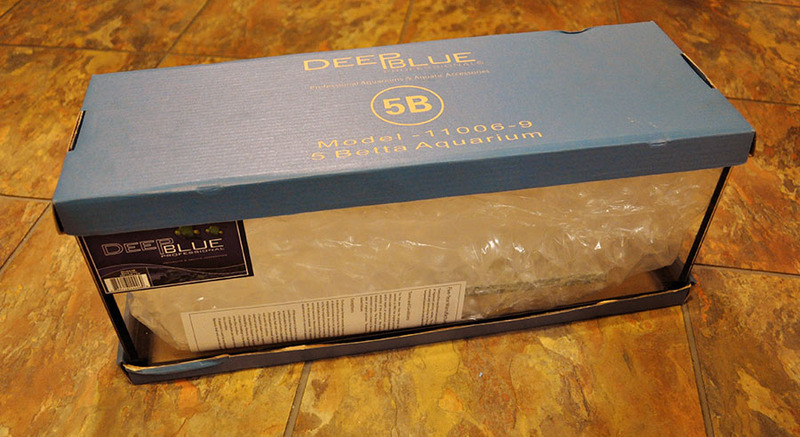 Exterior packaging now removed, we see what the Deep Blue Professional 5-Way Betta Aquarium would look like “on the shelf” at your LFS. Take off that blue cardboard and let’s see what’s inside. After removing the cardboard top and bottom, the cover glass is revealed. It is shipped already in place, but without a handle it’s difficult to remove it. I found the best way to lift the glass is to turn the tank on its side, and insert a razor blade between the glass lid and rim to gently pry it out and into my waiting hands. It’s worth noting that all the glass edges are beveled; a really nice touch. It’s best to turn the tank on its side and use a razor blade to help unseat the cover glass from the tank. 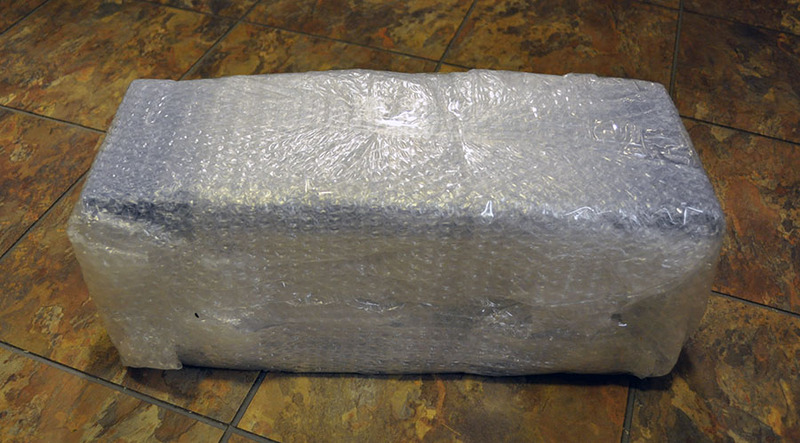 When removing the interior bubble wrap, do so slowly so you don’t miss or drop something. Tucked within this filler I found both the handle for the cover glass as well as a small bundle of glass dividers wrapped together. Instructions / Warranty information, along with the glass dividers, are found inside the aquarium once the inner bubble wrap is removed. One everything is cleared away, it’s easy to see how this works. The upper plastic rim has slots cut into it where the glass dividers go. The 5 way Betta Aquarium all by itself. The fit of the glass dividers in the rim varied from loose to a little tight between the several tanks I set up. The dividers are sized to go all the way to the bottom glass of the tank, so if you’re going to use any substrate, put the dividers in first. Much like the cover glass, the divider edges are all beveled. The 5-way Betta Aquarium with all dividers in place. Installation of the handle is simple; remove the double sided tape and stick it on. I should point out, if you’re the type of person who wants everything to be perfect, makes sure you have the “DBP” lettering on the handle going the direction you want before sticking it on! 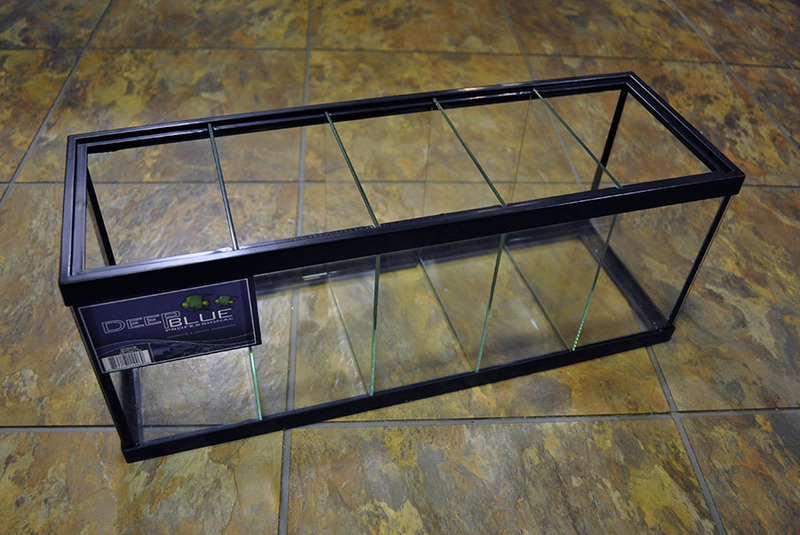 Handle installed, this Deep Blue Professional Betta Aquarium is ready to be put into use. There were a few things I noticed that I’d suggest for rethinking by the makers in future runs. First, the glass dividers, while easily spaced with the rim’s slots, are free to shift/move at the bottom. On more than one occasion I’ve knocked down the dividers by pouring water in too fast. I’d like to see some sort of slots at the bottom of the tank to hold the lower ends of the dividers. The fit of the dividers inside the tank is clearly loose; this allows some water to flow between the compartments. However, the fit is loose enough that if the divider is all the way forward or back, I’ve had a betta manage to squeeze through and enter the adjoining compartment. Obviously, two male bettas in a shared small space is exactly what we’re trying to avoid. I’d really like to see opaque dividers as either an included or add-on option. 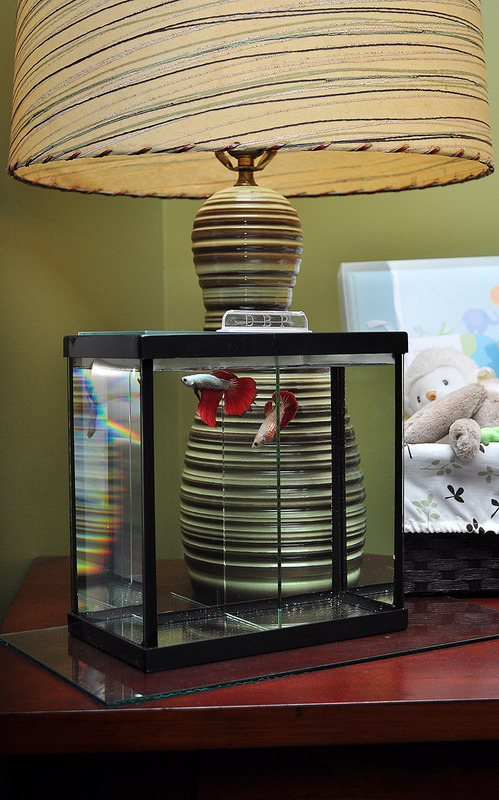 Some betta keepers find enjoyment in being able to remove an opaque divider between two fish, causing them to flare and display towards each other. Fish that are kept side by side in constant visual contact seem to lose interest in displaying once they realize that they can’t actually hurt each other! In theory, making the slots in the rim wider could accommodate both an opaque and clear divider, allowing you to pull the opaque one but leave the clear one behind. Alternately, simply having an opaque divider that could be quickly swapped out for glass would work fine too; the quick aquarist could perform the swap without too much worry about neighboring bettas having brief access to each other. A Halfmoon Plakat female, Halfmoon Plakat male, and a Halfmoon female, all reside in a 3-way Deep Blue Betta Tank. Pieces of catappa leaves give the water a yellow tinge. On all the tanks, the dividers seem to be a couple millimeters too tall. This may be the result of design specifications not considering the internal silicone seal, but then again, if they are cut too short, they won’t get caught by the rim of the tank (which is what keeps them upright in the first place). 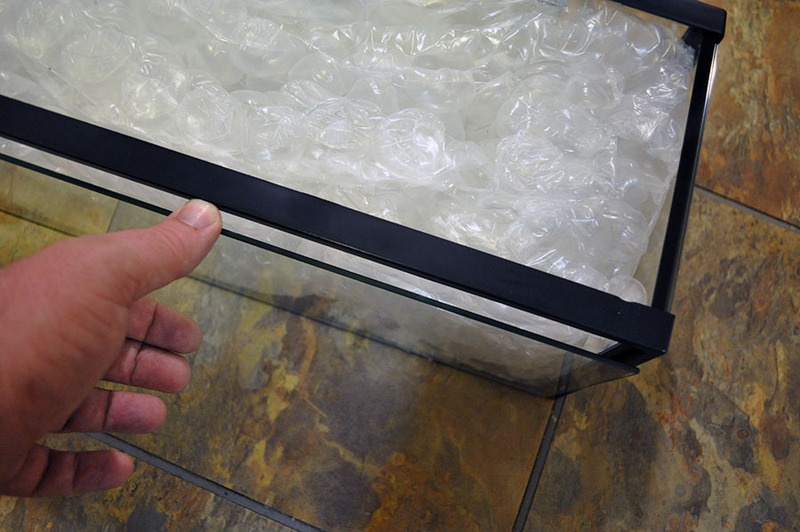 The net result of the divider length is that the lid doesn’t rest on the rim, but rests on the top edges of the dividers; it’s not quite the tight positive fit you’d probably want on a typical aquarium lid. Then again, you need some air circulation, so as-is, this arrangement allows for a little air exchange. If you look back at the first photo though, you can clearly see that the lid is not resting flat on the tank; this is the direct result of the glass divider being just a hair too tall. The lid itself looks awesome on this tank, but since it is a full glass lid there are some limitations. For example, any light that could clamp to the rim cannot be used with the lid. If you wanted to use a hang-on-the-back filter to turn one of these tanks into a pico aquarium, once again, the lid cannot be used. Even something as simple as a small internal betta heater can’t really be used unless the glass canopy is shifted to be partially open. I also had one of the handles come loose within 2 days of placing it on the glass. Not sure why this happened; I could probably fix it easily with some 3M double-sided foam tape. Looking at the packaging, there’s an opportunity to help users with handle placement. It would be really easy to add into the package artwork a simple handle-placement template. 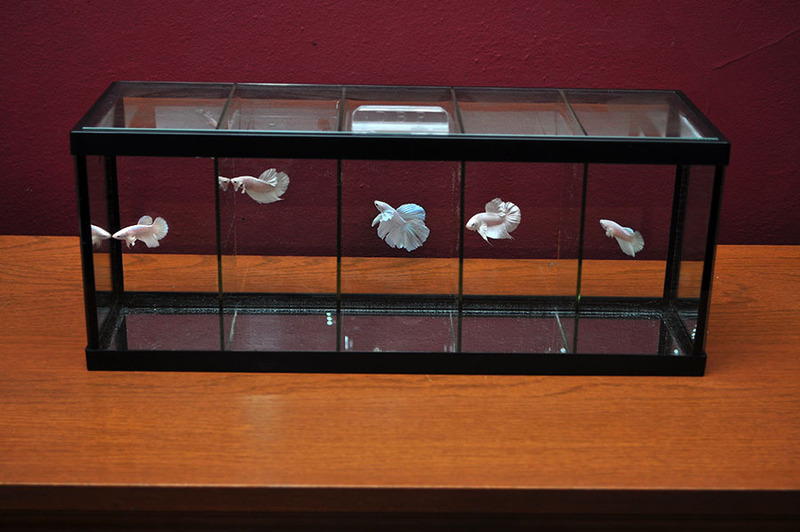 The aquarist could place the glass over/on the packaging and then have markers to line everything up perfectly. I’d love to see some color-enhancing LED lighting system for these tanks. It seems Deep Blue Professional has a couple lines of small LED fixtures, but none that would work on these betta tanks given the setup of the cover glass, save their SolarFlare™ Micro, a single LED spotlight gooseneck configuration that mounts with a suction cup. I found myself turning to general purpose LED desk lamps for illumination options, which aren’t terribly affordable and are a shot-in-the-dark when it comes to lamp color. A $25 LED Desklamp from Office Max wound up being a reasonable lightning solution for this Deep Blue Professional 2-Way Betta Aquarium. I could see something like an Ecoxotic Stunner Strip, Current USA TrueLumen / TrueLumen Pro, or ReefBrite (or any other small LED strip light) being a great addition to these tanks for illumination. 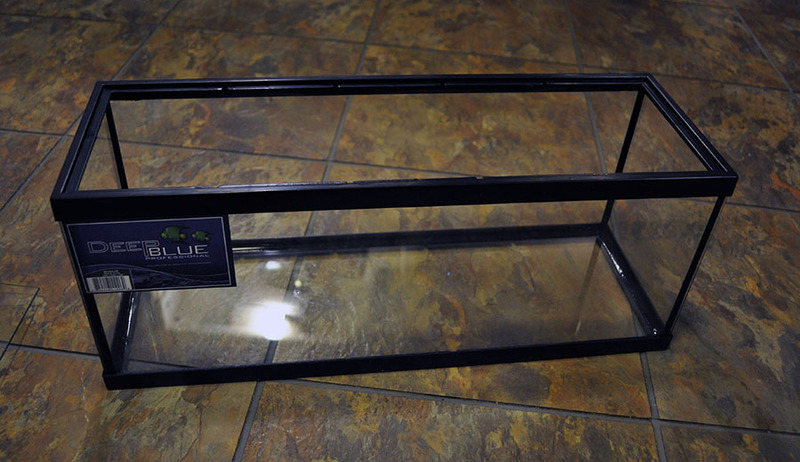 The TrueLumen Pro is of particular interest since its small mounting legs can easily be added to the strips to fit any particular aquarium, and the legs rest on top of the tank and come down the exterior, thus are compatible with the full-glass-canopy on these aquariums. First off – they’re glass tanks. This alone sets the Deep Blue Professional Betta Aquariums apart from almost every other betta tank on the market. 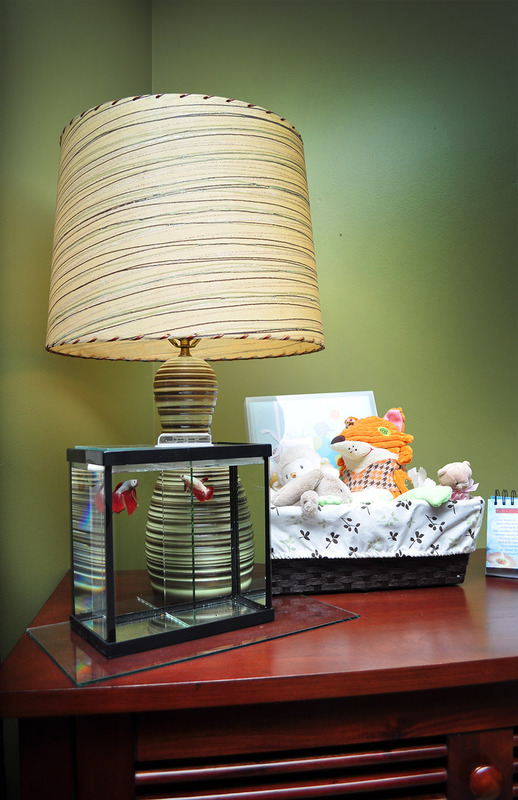 Glass adds a measure of durability and longevity, being more cleanable and scratch resistant than any type of plastic. The black silicone seals on the tank simply add to the curb-appeal. 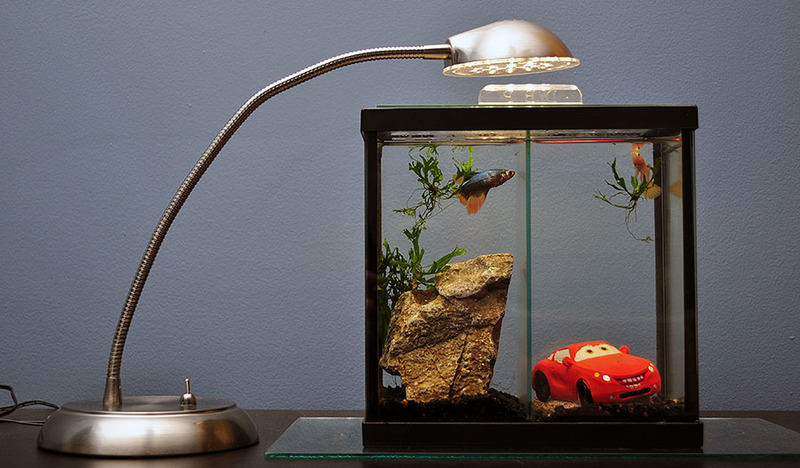 These aren’t cutesy, cartoony betta tanks, but instead they’re serious betta tanks that the discerning aquarist won’t be embarrassed to have on his or her countertop or desk. Plus, these tanks come with a 5-year warranty. Clearly, these are tanks you’re purchasing based on quality. One more look at the Deep Blue 5-Way Betta Aquarium in action. These are also tanks that potentially have uses and applications beyond simply being for bettas. I can only imagine what the 5-way tank would be like when repurposed as a small “pico-reef” style aquarium! According to the Deep Blue Professional Tempered Glass Spec Sheet their three betta tanks are not constructed with tempered glass…which means you can even drill ’em if you want! One last look at the 2-way betta aquarium from Deep Blue Professional, this one in my daughter’s room. While the betta breeder who needs to house 100 or 1000 individual fish will probably find a more efficient and inexpensive system for isolating their fish, the Deep Blue Professional Betta Aquariums are well-built, serious aquariums that will please the serious hobbyist who wants to keep a few prized specimens on display. These tanks are also ideal for anyone looking for a betta tank that is more substantial than something molded from plastic. As my first introduction to the Deep Blue Professional product line, I’m definitely curious to see more. So I agree that while Deep Blue generally makes quality products, this is despicable. Bettas should not be housed in anything less than 2.5 gallons per fish. It also dismays me that a serious aquarist would help spread misinformation on betta husbandry. “Fish that are kept side by side in constant visual contact seem to lose interest in displaying once they realize that they can’t actually hurt each other!” This is completely untrue, and giving two bettas a constant clear view of each other will result in sickness due to extreme stress. ” – aquariums that will please the serious hobbyist who wants to keep a few prized specimens on display.” Why is it hard to understand that bettas should be kept as more than specimens? They are intelligent, spirited little fish that deserve a real tank; not a bowl, not a vase, and not a bare glass box to be put on display. None of the tanks pictured in the article are heated or filtered, or provide adequate cover for a stress-free betta environment. It’s really disappointing to me that such a prevalent aquarist seems to have fallen into the same trap as a parent who buys their kid a disposable pet from Walmart – bettas deserve so much more than what these tanks can give them. I hope for their sakes that you, as a person who seems to think these tanks are acceptable, are not keeping and will never keep bettas. Julia, you might be right. Julia, oh my!!!!! I was looking for a divided tank to house my beautiful babies in one unit. This set-up seemed very small for 5 fish. Then , the clear glass and the horrible way it was explained that the fish would ignore each other after awhile really bothered me. I am a novice, but even I know that the fish would stress out under those conditions. I am looking at making my own tank now with proper dividers and size appropriate. it is called Marineland Aquarium. So far, I’m very satisfied, the fishes too. I’ve been using it for several years! Cheers! And yes, I agree with what you said about the fact that the fishes would stress under those conditions. I have been an aquarium hobbyist for many years (25), tropical and saltwater. Recently I have set up a Betta room. On the housing topic, I use the Deep Blue 5, BUT, I put 2 bettas in leaving (after gravel, hammocks, filter and heater) still over a 1.5G for the bettas. I make use of only 2 dividers (not the glass ones) for the middle and that is where I put the filter and heater. Now the filter of course would not be functional with the dividers being glass from top to bottom. SO, for the dividers, I make my own with black mesh (that I purchase from a hobby store, this allows flow of water throughout the tank.) I secure the dividers with either A. Reef safe putty, or B. Reef safe “super glue”, I have done my research and the reef parts are safe for tropical. keeping a betta safe gravel (do your homework) will add additional support for the dividers, mine have never moved. Also leaving a bare bottom tank may help with being able to not build up old food sludge…Just do not over feed. Enjoy watching your fish eat their meals, I hand feed all of mine, Omega one pellets, blood-worms and once a week un-shelled peas I have never had any accidents with fish slipping through the dividers, it is about taking time to do it right. This also allows the heat to flow evenly throughout the tank. The water parameters can be checked with test kits, and having more then one thermometer can prove the heat is reaching all parts. For the good bacteria I use TLC for freshwater, and I also keep a mini moss ball in each section for the fish, as well as adding from time to time the IAL. Also placing a double silk hammock for each fish, to hide and sleep. I have 3 “giants” that keep only in 4 to 5g, as well as larger HM and RT. Addition: disease. As mentioned above disease in fish fish as any living being is easy to spread. Sadly fish can be quick to succumb. So before housing multi fish together have a separate quarantine tank for new arrivals. Remove any fish that shows signs of illness from a multi fish tank and place in quarantine to treat. Also treat the whole multi tank. I have kept bettas up to 5.5 years. And a side note on the dividers, the mesh also helps so the fish cannot see each other. I have recently read that using a mirror for a short period of time in for the fish helps for them to display and exercise. I have not done enough research on that and am not sure that I agree. It breaks my heart to see my water babies upset. I play with them by taking my finger along the side of the tank and having them follow it around, they seem to keep a peaked interest and it is a lot of fun for me as well. I read this article just for the divided aquarium idea. What I think Matt was doing was just showing the pros and cons for this specific tank. As with any type of pet you will get different types of owners, those who just want a, for lack of better phrasing, a “display pet”, this is the owner who may get the pet on an impulsive purchase and then they will give the absolute basic of care to pet. And then you will have the owner who will do their research on everything from the history of the fish to its wild ancestry. Having had many tanks throughout my life I am between the 2 types. Most people are somewhere in the middle. Some think this is not ok for tank size, some will say yes it is. No one really agrees what the ideal tank size is for a Betta. Personally I have had Bettas off an on for over 20 years. And I have housed them in everything from a crystal candy dish to 10 gal aquariums. All of my bettas lived well past 4 years old. As for fish disease spreading in divided tanks that is a big concern, if you keep your tank clean the risk can be minimal. As for the dividers: Bettas seeing each other constantly may loose interest in their display battles with one another or they may get overly stressed, like it was stated in earlier comments. THen again they may not care either. Bottom line is simple everyone has an opinion about what is best way to care for your Betta. 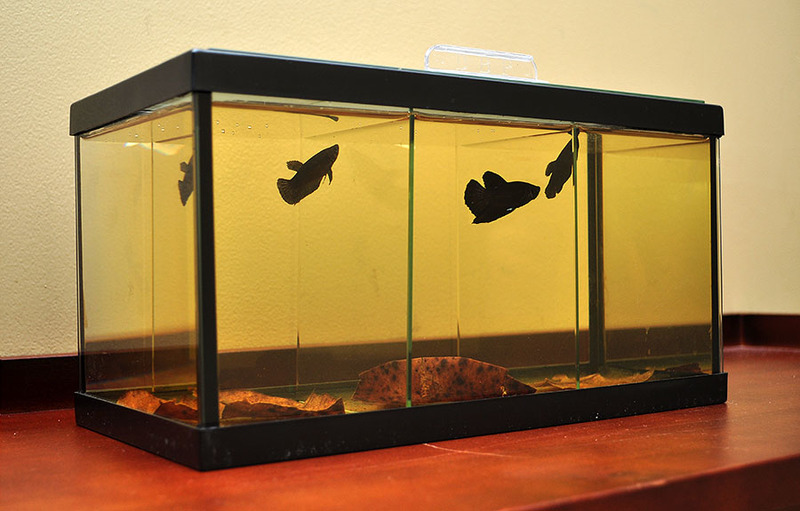 This isnt a horrible tank idea, i quite like it, only suggestion id make is to use a plastic instead of glass. But this is a good idea, dont listen to the judgemental people. Hello, have you thought about buying a 5 gallon aquarium? I host 6 fishes in there. I bought it from https://www.buyfishingguide.com/best-betta-fish-tanks/ it is called Marineland Aquarium. So far, I'm very satisfied, the fishes too. I've been using it for several years! Cheers! And yes, I agree with what you said about the fact that the fishes would stress under those conditions. All the best! I read this article just for the divided aquarium idea. What I think Matt was doing was just showing the pros and cons for this specific tank. As with any type of pet you will get different types of owners, those who just want a, for lack of better phrasing, a "display pet", this is the owner who may get the pet on an impulsive purchase and then they will give the absolute basic of care to pet. And then you will have the owner who will do their research on everything from the history of the fish to its wild ancestry. Having had many tanks throughout my life I am between the 2 types. Most people are somewhere in the middle. Some think this is not ok for tank size, some will say yes it is. No one really agrees what the ideal tank size is for a Betta. Personally I have had Bettas off an on for over 20 years. And I have housed them in everything from a crystal candy dish to 10 gal aquariums. All of my bettas lived well past 4 years old. As for fish disease spreading in divided tanks that is a big concern, if you keep your tank clean the risk can be minimal. As for the dividers: Bettas seeing each other constantly may loose interest in their display battles with one another or they may get overly stressed, like it was stated in earlier comments. THen again they may not care either. If you are going to use a divided tank, then find a way to make the divider opaque by using aquaruim wallpaper. ( If you have to use an adhesive make sure it is tank safe. All with the tank wall paper) Bottom line is simple everyone has an opinion about what is best way to care for your Betta.